The massively popular social media site, Facebook, is an important part of many people’s lives. Every day, Facebook users log into their account to browse their timelines, update their many friends, acquaintances, and family members about how their day is going, and generally unwind and relax. Impressively, the minds behind this virtual conversation hub continue to roll out significant updates and changes on the site on a regular basis, and the latest feature unveiled by Facebook is definitely one of their most intriguing ones. Facebook recently introduced an audio recognition feature for users of their social media site. Much like familiar apps like Shazam and Soundhound, this new feature can recognize songs, and even TV shows. Mobile Facebook users can now enable this audio recognition feature for their status updates, which can list the song or television show that you’re listening to or watching. Other Facebook users can then listen to a 30-second clip of the song that’s recognized by this feature. Though this feature is only currently available in the US at this point, and can only be used by users with a mobile device (iOS and Android-compatible phones and tablets,) it shows how those at Facebook refuse to remain stagnant, and are always working on new ways to stay newsworthy and relevant for users. 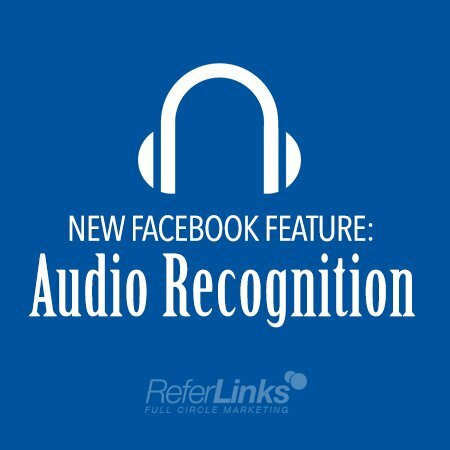 How do you feel about this latest audio recognition feature for Facebook? Do you hope that it can eventually do more than just recognize songs and TV shows? Feel free to leave your comments below! This entry was posted in Social Media and tagged Facebook,Facebook Audio Recognition,Online Marketing,Social Media,Social Media Marketing on July 1, 2014 by ReferLinks Online Marketing.